So the new Federal Reserve chairman will be a male, Republican version of Janet Yellen. Hope and change, baby! 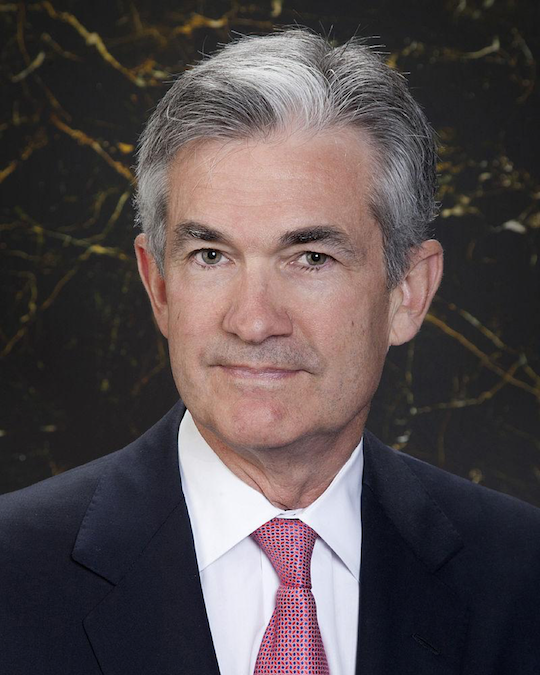 Sometime today the president will name Jerome “Jay” Powell; if confirmed by the Senate, he’ll take over on Feb. 1, a few days before his 65th birthday. Aging movie heartthrob Jay Powell. “What the ****, bro? 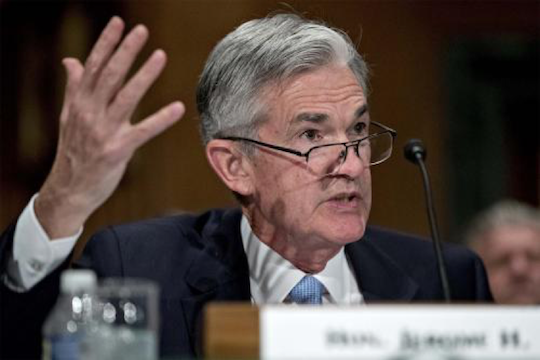 !” Jay Powell. He’s a gray man with a gray background ideally suited for a gray job. Princeton bachelor’s degree, Georgetown law degree, investment banker, a gig in the Treasury Department under Bush the Elder, partner at the private-equity giant The Carlyle Group (which is loaded with Bush family hangers-on), member of the Federal Reserve Board of Governors since 2012. “The most important fact about Jay Powell’s appointment is that there will be no change in monetary policy,” Jim Rickards writes us from Australia. Jim has crossed paths with Powell over the years, because who hasn’t Jim crossed paths with? “I worked with him when he was at the U.S. Treasury and I was general counsel of a major primary dealer in government securities. The primary dealers act as underwriters at auctions of U.S. Treasury securities, so in effect, Jay was my firm’s biggest customer. “My impression of him was that he was highly professional and always acted in the best interests of the Treasury and the taxpayers. He’s smart, high integrity, and has had a distinguished career both in public service and in a private capacity at investment funds and think tanks. 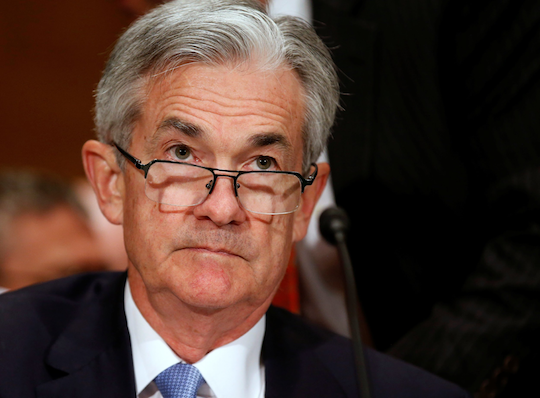 “As a Fed governor, Powell has never voted against Janet Yellen on any interest rate policy decision,” Jim goes on. That means in an ideal world, the Fed will raise its benchmark fed funds rate every three months — from roughly 1% now to 3% by 2019. It’s the old bullets-in-the-chamber thing; the Fed needs to raise rates so it can lower them again whenever the next recession rolls around. The problem is it’s not an ideal world. As we’ve documented every month since February, the Fed’s preferred measure of inflation — “core PCE,” it’s called — is steadily falling. The most recent reading is 1.3% — way off the Fed’s 2% inflation target. Yesterday at its most recent policy-setting meeting, the Fed stood pat on the fed funds rate; everyone expected that. Nothing happens at Fed meetings that occur early or late in the month. But at the next meeting in mid-December — Yellen’s last — nearly everyone expects a quarter-percentage point bump up. Jim is in a distinct minority; he says inflation is too low to justify it. The tell for what happens on Dec. 13 will be the next release of the core PCE number, due Nov. 30. Says Jim, “If the number is hot, say 1.6% or higher, that will validate Yellen’s view that the inflation weakness was ‘transitory’ and will justify the Fed in raising rates in December. “On the other hand, if that number is weak, say 1.3% or less, there’s a good chance the Fed will not raise rates in December. In that case, investors should expect a swift and violent reversal of recent trends. To the markets today… which are oscillating with every new rumor dripping out about the Republican tax reform plan. The plan was supposed to be released yesterday… but some lobbyist must’ve gotten wind of something he didn’t like the night before and raised holy hell with House Speaker Paul Ryan or Ways and Means Committee chairman Kevin Brady. So the release was put off till today while aides furiously rewrote the offending section or sections. We won’t attempt to analyze the bill until we can examine its provisions as a whole. But traders feel compelled to act on every new scrap of hearsay and as we write all the major U.S. stock indexes are slightly in the red. The Bank of England voted this morning to raise its benchmark interest rate for the first time in a decade. But the BOE also signaled more gradual future increases than traders were expecting. Thus the pound has tanked more than 1% at last check. to $1.31. Gold is pushing up toward $1,280 for the first time in nearly two weeks. If you’ve given even the slightest thought to going solar, better get on the stick. Back in July, we were discussing the likelihood of an escalating U.S.-China trade war. Most of the media attention was on steel — but we also mentioned solar panels were in the cross hairs. This week the U.S. International Trade Commission recommended a stiff 35% tariff on imported panels. The wild thing is that not everyone in the U.S. solar industry has been agitating for these tariffs. It’s mostly two manufacturers that have been pushing hard — Suniva and SolarWorld. Meanwhile, companies that install solar panels say they’ll end up losing jobs if the price of panels rises and fewer people decide to go solar. The Solar Energy Industries Association opposes the tariffs. The White House will decide by January whether to accept the commission’s recommendation.We daresay it’s a foregone conclusion; the president can thump his chest about how he stuck it to the Chinese and saved American jobs, and no one will challenge him about the other jobs that go bye-bye. The number of Americans giving up their citizenship is likely to set another record this year. The Treasury Department released its third-quarter figures yesterday. Through the first three quarters of the year, 4,448 Americans have surrendered their U.S. passport. That’s already more than any other year except last year. We wouldn’t even bother with the expatriation numbers except that we see mainstream news sources once again latching onto the bogus notion that it’s “the rich” who are leading the charge in giving up their citizenship. 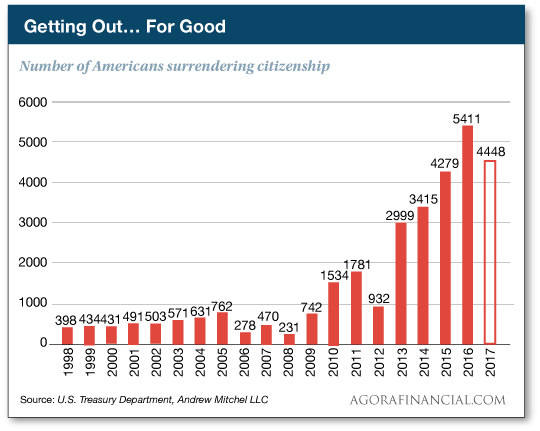 From a Newsweek account: “The number of American citizens renouncing their citizenship began to increase in 2010 and 2011 after the Foreign Account Tax Compliance Act (FATCA) became law. The law’s aim was to curb tax avoidance by Americans living abroad by asking banks and others holding the assets of American citizens to report them to U.S. officials. Wrong, wrong, wrong. The $50,000 figure applies to your total “foreign financial assets.” But any bank or brokerage account with a balance of $10,000 or more must be reported both on your 1040 and on an FBAR, or Foreign Bank Account Report. In addition, the IRS’ compliance requirements for foreign banks are such that many of them simply refuse to do business with American customers. For a foreign business that hires an American employee, paperwork costs amount to $5,000 per person. And a typical citizen living overseas, regardless of their means, faces annual accounting costs of $2,000 a year — just to satisfy IRS bureaucrats. “Dave, your 5 min. Forecast was right on!” reads the first of many reactions to our Russia-related musings yesterday. “I get sick to my stomach when I hear what is an obvious propaganda statement from U.S. government followed by the equivalent of ‘And if you disagree with what I just said, then you’re a Russian-paid mole.’ What the hell ever happened to critical thinking? Or for that matter the truth? “This whole Russian thing, à la they hacked our political process, has smelled from the beginning,” says another. “We’re not talking a casual whiff as you stand downwind from a cheese store in a gentle breeze but full-on skunk turds once it really got rolling and the sanctions against Russia came flying in with a 98-2 vote. The mystery is why anyone is listening. “As you guys have pointed out numerous times, the U.S. has been in the business of actual regime change as a national political sport across most of the international landscape since at least the ’70s, and while the Russians didn’t apparently do much to affect our election in reality, one could hardly blame them for trying if they did. “Your defense of Russia wasn’t very convincing,” says a counterpoint — in a letter we’ve had to truncate for time. “I get that for gold bugs Putin seems to be a wise guy. But just because Putin has done one thing right (bought lots of gold) doesn’t mean the economy won’t be totally destroyed when **** hits the fan. Other pillars of Russian society are just too weak. Look what’s happening on the grassroots level. You want to talk about Ukraine and Georgia? In Georgia in 2008, the hotheaded president launched an artillery barrage on a rebel province where Russian peacekeeping troops were stationed. The gambit to bloody Russia’s nose backfired badly when Russia drove Georgian forces out of both that province and a second breakaway province. Yes, Russia’s bombing of the Georgian capital was overkill. Ukraine, meanwhile, is now governed by a candy tycoon who lives in constant fear that the neo-Nazis in his governing coalition will depose him at any moment. “I was delighted to see your mention of listening to Radio Moscow on shortwave,” writes our final correspondent. “One summer while in college I had an all-night job weighing trucks of cotton seed, and to pass the time I listened to reports of the Korean War, in which the ‘enemy’ was us. It was starkly curious to hear the reverse labeling. The 5: It started earlier. By some accounts, Putin was the first foreign leader to call Bush after Sept. 11 to offer assistance. Bush thanked him for the gesture a few weeks later by announcing the United States would unilaterally withdraw from the Anti-Ballistic Missile Treaty, which had been in force for 30 years. P.S. We’ve gone to considerable lengths to protect a short video clip we released this week. There are stiff penalties attached to its misuse. Why all the fuss? Check it out for yourself. Just don’t share it with anyone, please.